Early fall snow pack on Mount Shasta. 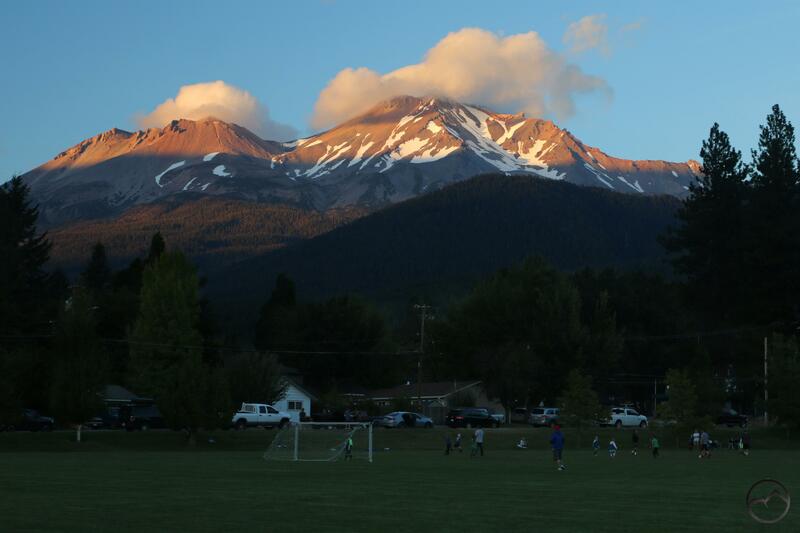 When I posted my little collection of images taken my son’s soccer practice, I was reminded of an image of Mount Shasta I took way back in the early days of HikeMtShasta. My family had joined a few other families at Shastice Park in July for an evening picnic. As the sun set, I pulled out my camera and snapped a few shots of the mountain as it was lit with alpenglow. The previous winter had been the first of two disastrously bad winters, where very, very little snow fell. By July the snow was starting to get sparse. Avalanche Gulch had already passed as a good route to the summit and activity was shifting over to the Clear Creek route, which is much more realistic when snow is not thick on the ground. I am not sure why the image from back then popped into my head last night but I dug it out and was struck how, even now, at the end of September, there is still more snow on Mount Shasta than there was at the beginning of July in 2013. That is dramatic testimony to how bad the winter was that year and how plentiful the snow was this year. Personally, I am hoping we have a perfectly average winter this year. Plenty of snow, but not so deep that summer on the mountain doesn’t start until August. I am sure I am not the only one who is eager for some winter mediocrity. We’ll find out soon enough! Beginning of July 2013 on the left. End of September 2017 on the right. Fall sunset on Mount Shasta. Fall is here. I know this because the calender says so, from the weather, and by the fact that my son is in the throes of soccer. Autumn has officially begun and the weather is absolutely gorgeous. The nights have been cold and the days are spectacularly ideal. Of course, I have had to build some fires for my wife and our garden is now covered and unhappy, but the scenery and temperature could not be better. That was particularly true today. There were some small lenticulars early in the day and the morphed into larger disks above the mountain. By afternoon they were gone, though some interesting clouds did threaten to become lenticulars. Alas, they did not. Indicative of the coming of fall, we are now in the thick of soccer season. My son has practice twice a day at the middle school here in Mount Shasta. Honestly, it is hard to imagine a more idyllic, spectacular location for an athletic field. There is a 360 degree view of the mountains around town. The panorama includes the Battle Rock and the high peaks of the Castle Crags Wilderness, Mount Eddy, Black Butte and, of course, Mount Shasta. With so much to observe, it is honestly hard to concentrate on watching the soccer at times. This evening was one of those times. The sunset was beautiful and the kids were having fun, so I pulled out my camera (again) and documented the changing clouds and light. As the sun set, all was well. It makes me glad to be able to raise kids here! Be sure to head out and enjoy the magnificent weather. Last year the first week of October was excellent and it then rained for a month straight. Best take advantage of the good conditions while it lasts! 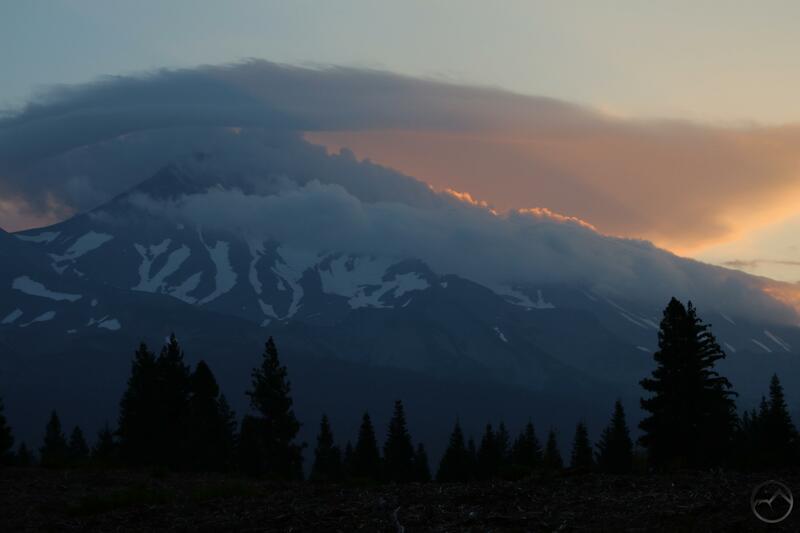 A September lenticular cloud marks the coming of the lenticular season on Mount Shasta. 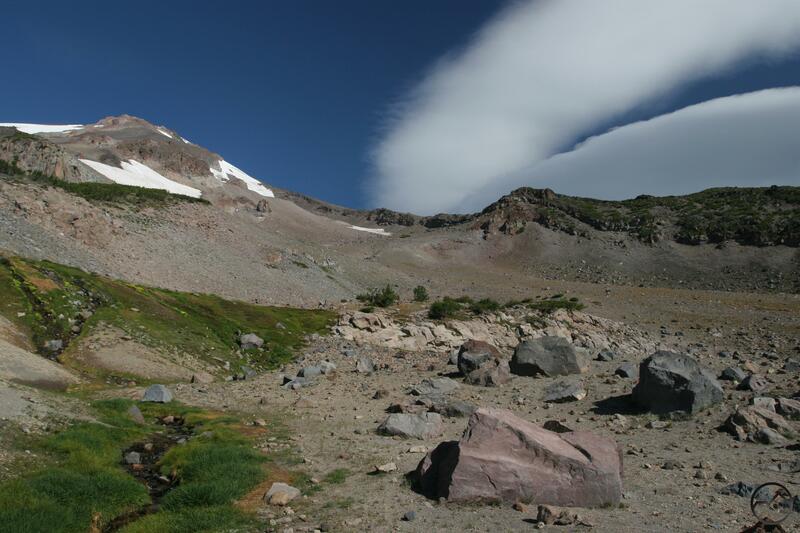 As summer ends, we can look forward to the gorgeous fall hiking season here in Mount Shasta. While the we may lament the approaching winter and the passing of this year’s gorgeous summer (despite the smoke), there is another thing we can look forward with a great deal of anticipation. Fall marks the beginning of the time of year when lenticular clouds occur with a notably higher degree of frequency on Mount Shasta. This means that, while we may not be able to hike the trails in the Trinity Divide, high up on Mount Shasta, or in the surrounding mountain ranges like the Trinity Alps, we do have the opportunity to enjoy the grand spectacle of these magnificent cloud formations heightening the mountain’s unique grandeur. Indeed, uniqueness and beauty of these strange clouds makes this one of the highlights of the year. As is often noted, the mountain creates its own weather and it can do so at any time of the year. Naturally this means lenticular clouds can occur throughout the year as well. However, fall and winter have a demonstrably higher frequency of the clouds’ manifestation. To show this, I collated all the images I have from the last 10 years and broke them out into the months when they occurred. Some of the clouds are exactly lenticular clouds, but they are unusual in shape and exhibit at least some of the qualities of the famed formations. Obviously this is not exactly scientific documentation since I have missed some of the clouds. Nonetheless, generally speaking, if there is a lenticular I try to capture it in some fashion. Taking the fact that I have missed some of the clouds, this display still demonstrates what months have greater likelihood of lenticular clouds appearing around Mount Shasta. Hopefully the upcoming lenticular season produces some exceptional specimens! High Camp Basin below the PCT. Lush Hummingbird Meadow offers dramatic views of Red Butte. 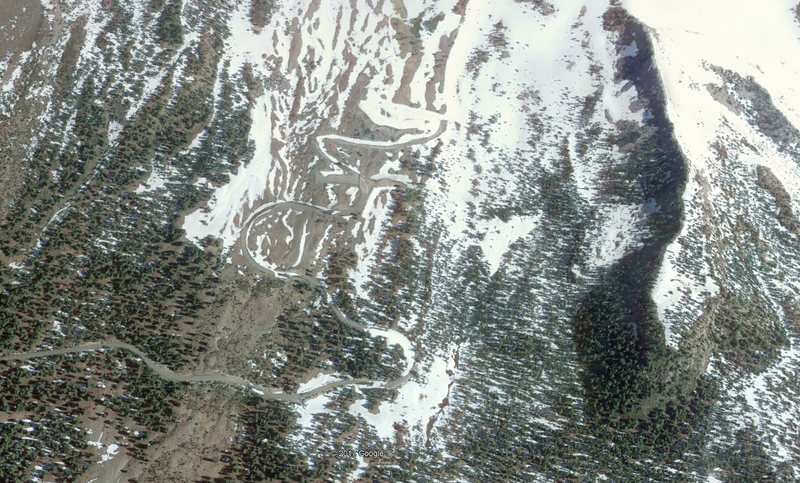 The Old Ski Bowl area is one of the most popular destinations on Mount Shasta. When the road from Bunny Flat is open, this incredible area is an easy-to-get-to highlight that features fascinating geology, incredible views of Mount Shasta and magnificent vistas that extend dozens of miles to the west and south. All of these features help make the Old Ski Bowl one of the most popular trailheads on the mountain. Trails traveling higher up into the Old Ski Bowl, South Gate Meadow, Panther Meadow and even Gray Butte all begin at the Old Ski Bowl. While these are all worthy hikes, in their midst is another easily reached spot that is often overlooked as a destination unto itself. This is the beautiful combination of Hummingbird Saddle and Hummingbird Meadow. Though neither is officially named, the term “hummingbird” has long been applied to the saddle and meadow that lie on the eastern edge of the giant Old Ski Bowl. How the name came to be associated with these landmarks is a bit of a mystery. Although the saddle is devoid of anything that might interest a hummingbird, the meadow offers abundant and sweet work for the hummingbird to cultivate. While the name may be somewhat mysterious, the area itself does see a fair amount of human visitors since it lies along the upper route to South Gate Meadow. However, it often seems to be the case that this lovely little patch of the giant mountain is often sped through in the effort to reach the great fountains of South Gate Meadow. This trend is compounded in dry years when the small meadow’s flowers and spring are not vigorous and it tends to dry out quickly. Yet Mount Shasta’s Hummingbird deserve a little recognition on its own merits. If it did not lie along the path to South Gate, it would deserve to be a distinct destination. Hopefully it can be elevated above its current, overlooked lot and be appreciated for its own great beauty. Saddle vista of the Sacramento River canyon and the Castle Crags. Coming from the Old Ski Bowl, the saddle is the first Hummingbird encountered on the way to South Gate Meadow. Braced by Green Butte to the west and Red Butte to the east, it is a striking landscape that marks the entrance to the Mount Shasta Wilderness. Aside from a few fragile plants and some stunted white bark pines, the saddle is a fairly barren landscape. However, what it lacks in vegetation, it compensates for in incredible views. To the west, the Trinity Divide, great rampart of the Klamath Mountains, rises on the far side of the Strawberry Valley. Mount Eddy is particularly prominent. Beyond these mountains the oft-snowy peaks of the Trinity Divide can be discerned. The southerly view takes in the canyon of the Sacramento River as well as the Castle Crags, Grey Rocks and a significant chunk of the “McCloud Range”. Looking east, the crimson cliffs of Red Butte are striking. Above this whole scene is the majestic mass of Mount Shasta. 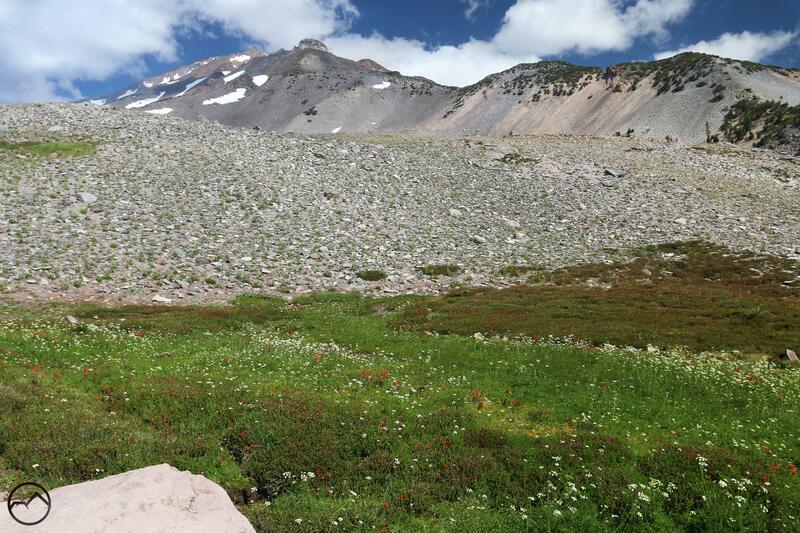 Aside from the summit of nearby Gray Butte, it is possible that this is the most view-packed spot on Mount Shasta accessed by a maintained trail. Shastarama Point looms above Hummingbird Meadow. Lying in a small valley between the saddle and the flaming walls of Red Butte, diminutive Hummingbird Meadow is a stunning oasis amidst the barren volcanic landscape that is Mount Shasta around the treeline. The meadow is sustained by a small spring. The clear, cold water gives life to lush grass and dense explosions of wildflowers despite the inhospitable, yet beautiful, landscape. 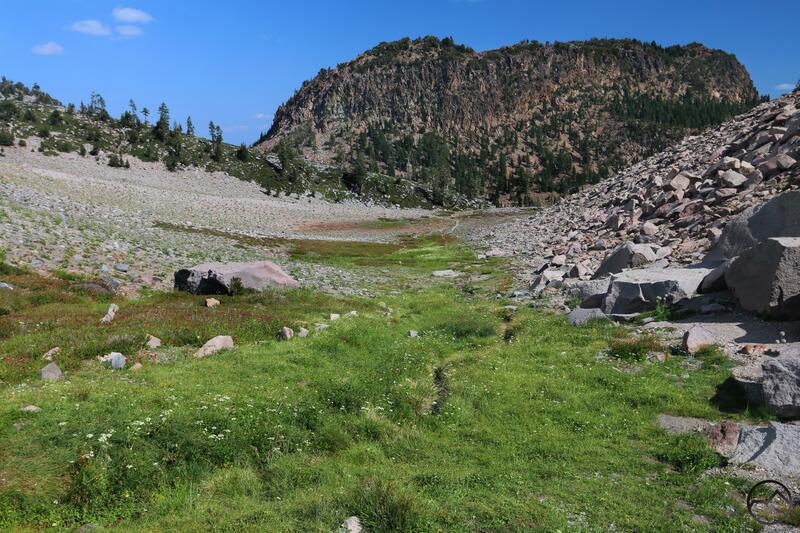 A small stream flows musically through the grass before reaching sandy soil and dissipating into rock-strewn sand that makes up the slopes of Mount Shasta. High overhead, the great block of Shastarama Point is a dramatic landmark. Large rocks immediately south of the meadow offer excellent places to sit and appreciate the lush and fleeting beauty of Hummingbird Meadow. 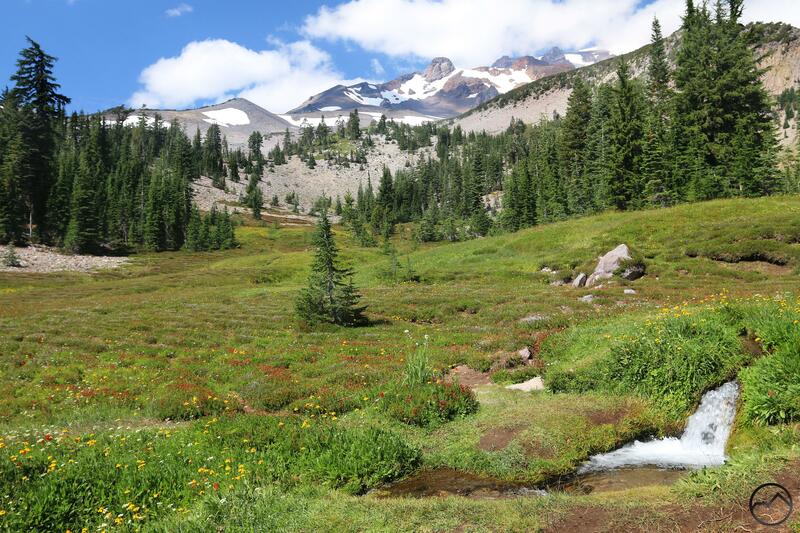 It may not be a marquee destination, but the meadow is a worthy destination for a short, quick hike on Mount Shasta. 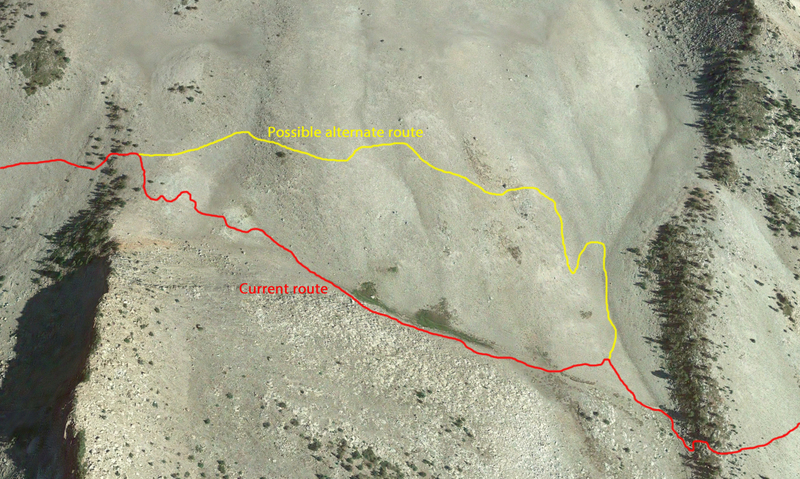 The current route of the trail to South Gate Meadow takes hikers right alongside Hummingbird Meadow. Older, narrow paths once passed through the small, delicate patches of grass but this have been condemned and the meadow is slowly reclaiming these routes. Nonetheless, the meadow is at times threatened by careless hikers who trample the fragile landscape. To protect this small area further, the section of trail that passes next to the meadow is slated to be closed and the way to South Gate Meadow will be rerouted away from the meadow. While the course of this new trail is not yet set, it seems that taking the path north makes the most sense. The way south is a large talus field and would not make the easiest trail work while just north of the meadow is a low, barren knoll that would easily accept a new trail. While it is somewhat disappointing to lead people away from the meadow, it makes sense to do this in order to keep careless people from damaging the small path of life. Given that there are no trees, the new route would surely be scenic too, with incredible views in all directions. 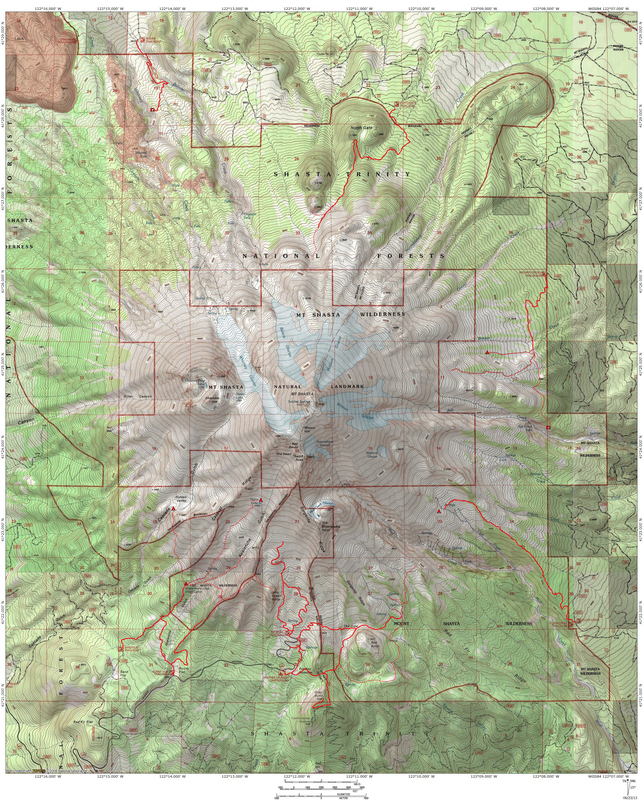 Hummingbird Saddle and Meadow are not premier destinations on Mount Shasta. They nonetheless deserve to be loved and appreciated, whether en route to somewhere else or on their own merits and as destination unto themselves. Red Butte seen beyond Hummingbird Meadow. Hummingbird Saddle view of the Sacramento River Canyon, Castle Dome and the Castle Crags. 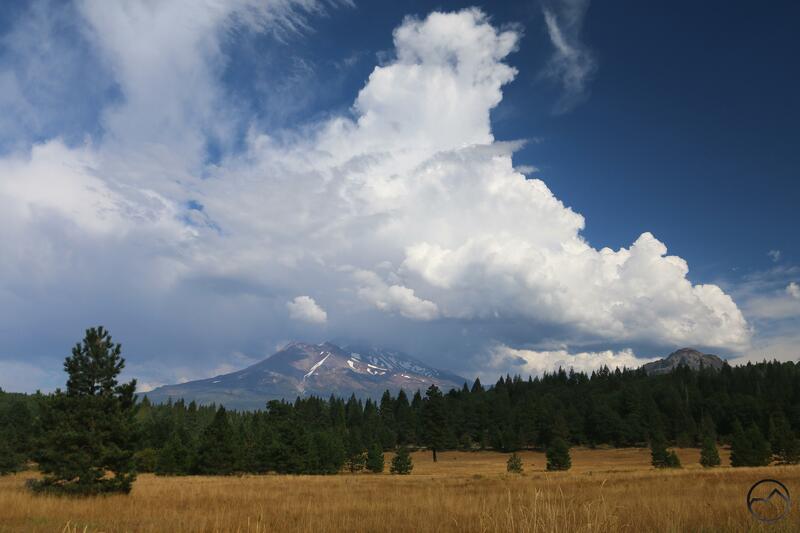 Awesome late-summer thunderclouds above Mount Shasta. 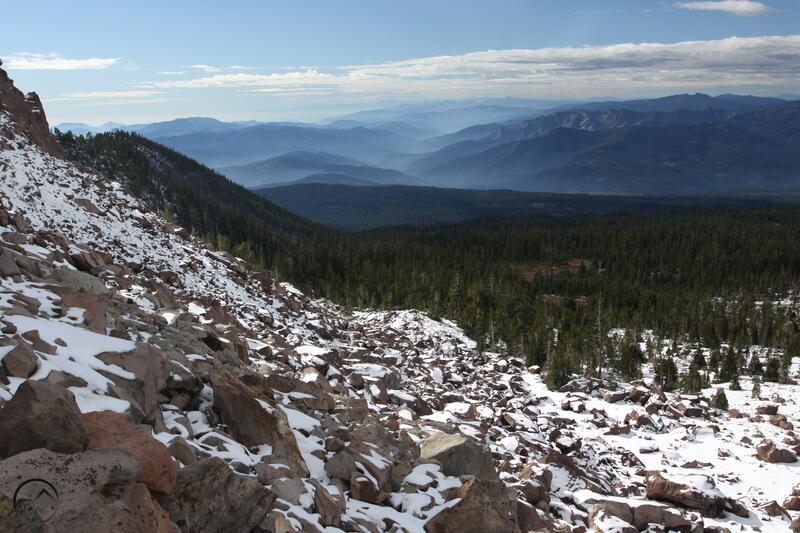 With the passing of Labor Day, the end of the traditional summer hiking season has ended and much of the traffic up on Mount Shasta has dissipated. School is back in session and vacations have passed. Even the weather seems to recognize that the summer is over. With only a week left before the official start of autumn, temperatures are dropping and while daytime conditions are near perfect, night is starting to feel cold. Fall hiking around Mount Shasta is always a pleasure, often marked by pleasant weather and fall color. This year, however, a different opportunity presents itself. With the deep snowpack and late start to summer conditions at the higher elevations, the onset of autumn is also delayed. That means that the springs on Mount Shasta are gushing, many of the wildflowers are blossoming and the grass is green and lush. Even some of the more ephemeral springs are producing notable amounts of water, sustaining their small patches of life that thrive amidst the barren sea of the volcano’s rock, cinders and sand. Indeed, conditions are nearly ideal. 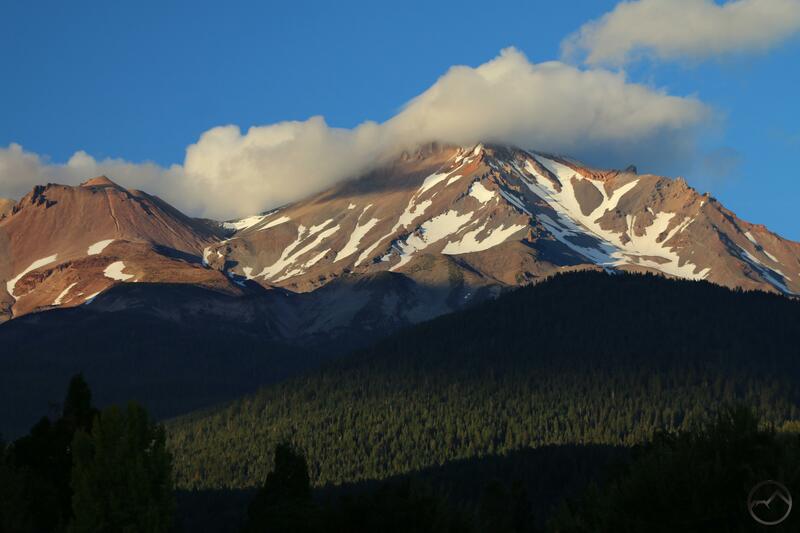 The summer crowds (such as they are in Mount Shasta) have passed and yet peak summer conditions persist! This is particularly true of the trails the begin along the Everitt Memorial Highway. Easy access and spectacular scenery await! Yes if there is one element that is less than ideal, it is the persistent presence of smoke in the area. Fortunately, the trails on Mount Shasta are high and, for the most part, climb above the smoke layer. Blue sky, cool breezes and clean air are usually found along the trails now. Particularly attractive right now are the hikes to South Gate Meadow and Horse Camp. As noted already, the wildflowers and spring-fed creeks are in great shape right now. At Horse Camp, the grasses are still green and much of the lupine and rabbit brush still have blossoms on them! Moreover, a fair amount of snow still clings to the upper section of Avalanche Gulch, giving the area more of an alpine feel, as well as emphasizing the great height and immensity of Mount Shasta. Obviously things are not going to stay this way. As noted, the coming of autumn is presaged by the dropping temperatures. Flowers are going to diminish and the grass will die. But, while the rest of the mountain will be preparing for winter, the springs are still gushing. The creeks are large is raucous and the cascades are gorgeous. For now, the rare opportunity to enjoy the mountain in its glory right now is a real blessing. I hope everyone is able to appreciate it while we can! 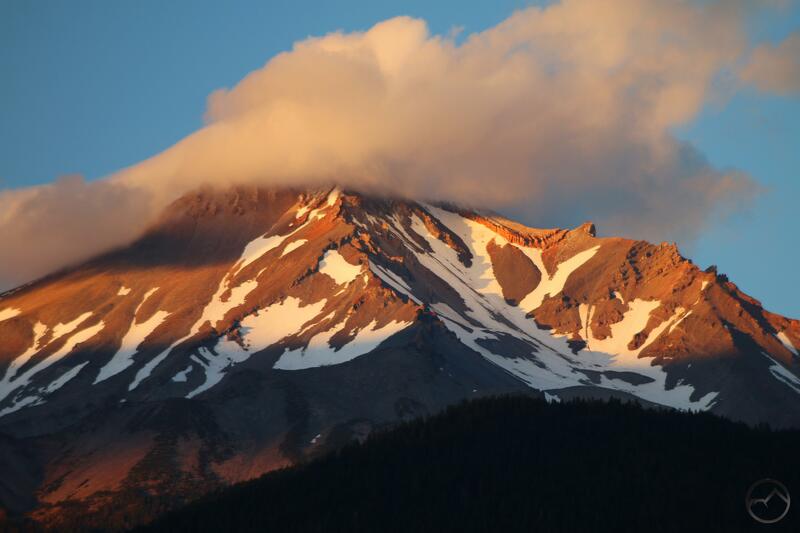 Get out and explore Mount Shasta while conditions are excellent! Summer splendor at South Gate Meadow. After heading to South Gate Meadow over the weekend and seeing Mount Shasta in its full summer glory, I was struck by the lateness of the peak this year. Now, as we near the midpoint of September, the meadows, flowers and fountains of the mountain are at the crescendo of their beauty and lushness. Flowers are exploding, the springs are flowing vigorously and the grasses are a verdant green. September is always a lovely month on the mountain, but it seems that this year’s clock has been pushed back considerably. September’s verdant meadows on the mountain. This, of course, should not come as a surprise. The winter of 2017 was a thankfully heavy one. I have lived in Mount Shasta since 2007 and over the last 10 years, I would rate last winter as the third highest in terms of snowfall (after 2010 and 2011, both of which dumped almost twice as much as what fell in 2017). Naturally, the heavier snowfall pushes the timetable for everything back and this is definitely true for life on Mount Shasta. There was still several feet of snow at Bunny Flat at the beginning of June and spring was really just setting in at that time, let alone the summer’s eruption of mountain life. 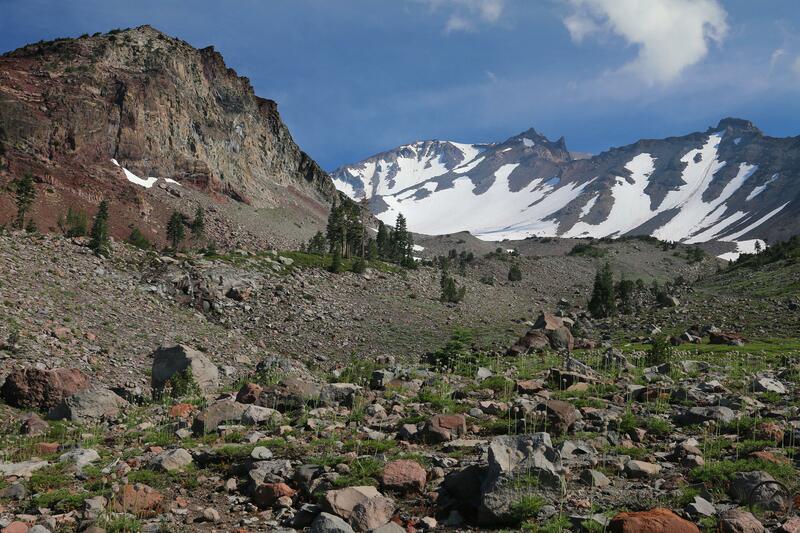 It was always going to be an unusual summer timetable and for those of us who were waiting to hike some of our beloved trails on Mount Shasta, we were going to need to be patient for the warm summer weather to work its magic. One week beyond the road’s normal opening date, there is still significant amounts of snow on the pavement. Perhaps more importantly, Upper and Lower Panther Meadows were completely covered in snow. This meant that not only did the snow on the meadow need to melt, the meadows then needed to have a chance to dry out a little. Waterfalls and flowers at the Old Ski Bowl. Of course, July 21st came and went and beyond that no date was given for when the gate at Bunny Flat might be opened. Finally, 5 weeks past the traditional date, the road was clear and vehicular access was granted for the Old Ski Bowl. It was not normal conditions at road’s end either. Not only were the pasque flowers seeding out abundantly, but everything was green and lush. Crowning the unusually verdant scene was a lovely waterfall cascading down the rocks below Green Butte. The rushing water’s symphony was audible where normally none is ever heard. It was marvelous. Though I would not want to wait 5 extra weeks every year to get up to the higher trailheads at the end of the Everitt Memorial Highway, this year was a real treat. The delay in the flowering season was also serendipitous, since it gives us an opportunity to enjoy the wildflowers’ peak display when the skies are clear and blue. August turned out to be an exceptionally smoky month and had the timetable not been pushed back, the flowers would have had to be enjoyed in ugly, oppressive conditions. Thankfully they can be appreciated now, unusually in September, when the sky has cleared of smoke and the peak beauty on the mountain is truly peak. All in all, the winter was a blessing in many ways. Let us be grateful. It was really hot over the weekend but beginning Tuesday, the temperatures have been dropping and the changing weather seems to have flushed the smoke right out. 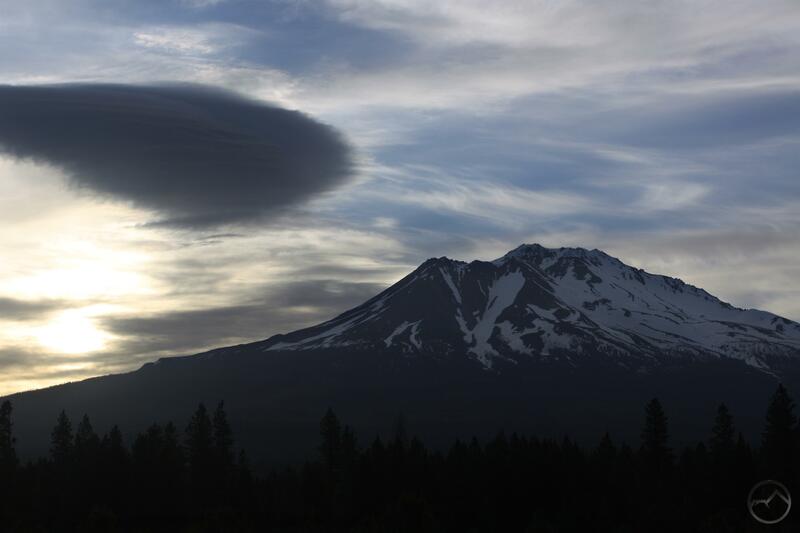 This morning was particularly nice, since there was no haze and Mount Shasta was graced with some fine lenticulars! I noticed them a little too late to really maximize the light, but I was able to get out to somewhere where I could capture them. Mount Shasta had a nice lens-shaped disk catching the morning light. While the shape of the cloud was not really unusual (though still quite beautiful), it was on this morning notable, since the sun, still low in the sky, was casting a shadow on the lenticular, just above Mount Shasta’s summit. That was a phenomenon I haven’t seen before from this angle and it was really neat to observe. To the northwest of the mountain was a large collection of turbulent clouds. They changed their shape pretty rapidly, but held to the general pattern of a large disk situated above a swirl of changing clouds. This too was a grand sight, though it would probably be better further to the south. Nonetheless, I was grateful to be able to witness it. All in all, a pretty spectacular morning, especially given how quickly it has come on the heels of a month of oppressive smoke. I don’t want to jinx us (I probably am for saying this) but this morning at least it feels like we have turned a corner. Cooler temps are in the forecast, autumn approaches and, Lord willing, we will be rid of the smoke for the rest of the year. I am still a bit downtrodden about what is going on in the Columbia River Gorge, but hopefully the worst is past in that fire and the healing can begin. Hopefully there will be more mornings like this one in the near future! Mount Eddy beneath clear skies and lovely clouds.